The 10th hull of the Pershing's flagship series was launched one week ago. 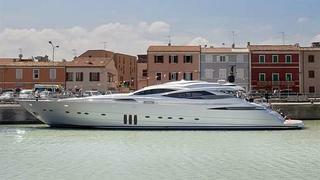 As usual, the ceremony took place at Marina dei Cesari in Fano, Italy. Like her previous sisters, the 35.37m motor yacht is designed by Fulvio De Simoni in collaboration with Advanced Yacht Technology and engineers of Ferretti Group. The yacht is customised to follow the owner's wishes and the contemporary interior accommodates up to 10 guests in four cabins, including a full-beam master suite. And three cabins for five compose the crew quarters. The Pershing 115 hull No. 10 is powered by twin 3,510hp MTU engines combined with KaMeWa waterjets, giving a top speed of 36 knots and a cruising speed of 34 knots.